It is homecoming week in Winner. There is no other community of this size that celebrates homecoming like Winner does and persons from all over the nation make a point to come “home” for their class reunion. The WHS homecoming is Sept. 28 and 29. 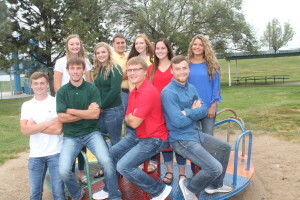 This year’s homecoming royalty candidates are Samantha Marts, Hanna LaCompte, Macy Olson, Macie Ferwerda, Ronae Klein, Nathan Smither, Matthew Smither, Justus Gregg, Riley Calhoon and Ty Bolton. The senior float riders are: Meredith Calhoon, Lexie Nedved, Elisabeth Duffy, Madelyn Hanson, Daesha Klein, Mason Schuyler, Alex Schaeffer, Levi McClanahan, Carter Brickman and Matthew Hartley. This year’s homecoming theme is Hollywood Homecoming. The coronation and alumni roll call will be held Thursday, Sept. 28, at 7:30 p.m. in the Armory. The crowning of the princess and warrior, announcement of the parade marshal and alumni roll call are highlights of the coronation ceremony. Mistress of ceremonies for coronation will be Madyson Morehart and Savannah Vogel. Ushers will be Hannah Hanson, Brekken Nagel, Dalton Baker, Zach Lapsley and Michaela Bachmann. The Winner High School band, cheerleaders and Warriorettes will perform at coronation. The burning of the W will follow the ceremony in front of the ag building. Any alumni reunions that require reserved seating call Mona LaCompte at the high school at 842-8125. There is also reserved seating for alumnus that prefer not to climb the bleachers and other seating is available on a first come first serve basis. Thursday afternoon prior to coronation is the annual pep rally. This fun event includes an eating contest, obstacle course, tug of war and class cheer challenge. The event starts at 2:15 at Warrior Field and the public is invited to attend. Spectators are encouraged to sit on the east end of the stadium, middle schoolers on the east end of the steps followed by 9-12 graders on the west end of the stadium. Each class will present their original class cheer and take part in a torch class contest. The winning class receives a free breakfast. On Friday, Sept. 29, all will dress in purple and gold as students and faculty prepare for the parade and football game. Parade entries are welcome from alumni classes, businesses and organizations. Any group that wants to participate in the parade can contact LaCompte and she will assign the parade entry a number. Entries will line up at the corner of 7th St and Country Club Road at12:30 p.m. Friday. The high school would like to remind everyone that the school and the fields are alcohol and drug free zones. Friday evening will be the annual homecoming football game as the Warriors will host Chamberlain in a 7 p.m. game. The pregame activities will start at 6:30 p.m. The WHS student council will have the concessions stand and proceeds go to help fund homecoming activities. The class colors chosen this year are: seniors—black; juniors—orange; sophomores—pink; freshmen—white; 8th grade—blue; 7th grade—gray; 6th grade—purple. Each day of homecoming there is a fun dress up day. Monday was movie or TV shows and students were encouraged to dress as their favorite character from any movie or tv show; Tuesday was identity theft day; Wednesday is wear your cape (Dress like your favorite superhero); Thursday is class color day and Friday is purple and gold day. The student council organizes and hosts the homecoming activities with the help of advisors Mona LaCompte and Lisa Jankauskas. Student council officers include: Abby Marts, president; Casey Stickland, vice president; Morgan Hammerbeck, secretary; Addy Root, treasurer; Madison Thieman, reporter; Gracie Littau, historian; Gabby Kocer, sergeant at arms/parliamentarian. The student council is so grateful to the businesses and organizations that have donated prizes and gifts to help make homecoming a success. There is so much school spirit in this community. “We’re very lucky to have such support for our school and the student activities,” said the student council. The Winner High School Class of 1977, which is celebrating its 40th reunion, is hosting a free all class dance at St. Mary’s Hall on Friday following the football game. All honored classes, graduates and non graduates are welcome. However, you must be 21 to attend the dance. The doors will open at 8:30 p.m. and the Black Water band will play from 9 p.m. to 1 a.m. Safe rides will be available for anyone who would like to take advantage of this service. Colome High School will celebrate its homecoming Sept. 28-29. 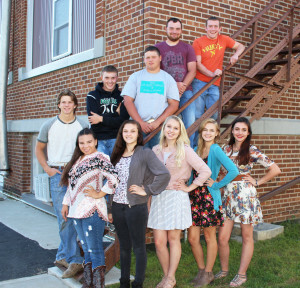 The royalty candidates are: Lynn Baker, Emalie Duley, Kaylee Bolton, Maggie McCarty, Rebecca Marso, Kolton Salonen, Nash Atteberry, Jamin Dougherty, Cody Assman and Zane Rohde. The coronation and alumni roll call will be held Thursday at 7:30 p.m. in the Colome gym. The MCs will be Jeremiah Yeaman and Andrew Laprath. The honor guard will be Kaydee Heath, Rayne Hermsen, Jaclyn Laprath, Matrix Noteboom, Beau Bertram, Wyatt Cahoy, Jackson Kinzer and Layton Thieman. Ushers are Haley Krumpus, Sara O’Bryan, Eli Kortan, and Cailob Week. Passing out programs will be Lanie Bolton, Saydee Heath, Allan McKenzie and Linkyn Petersek. The burning of the C will follow at the baseball field. On Friday, there will be a parade at 1 p.m. and the parade theme is cleaning supplies. The parade marshals will be Cindy Sealey, Renee and Greg Sherman. Prior to the football game, there will be a tailgate party at 5:30 p.m. put on by the after prom committee. The Colome Cowboy football team will take on Scotland in the homecoming game at 7 p.m. The Colome Legion will have its regular steak night on Thursday. On Friday, the Legion will be serving from 5:30 to 8 p.m. They will serve from the menu with full salad bar. On Saturday, the Legion will serve from 6 to 8:30 p.m. from the menu with full salad bar. The public is welcome to attend all three nights. South Dakota Public Broadcasting has received four nominations for the 2017 Upper Midwest Regional Emmy Awards from the National Academy of Arts and Sciences. One of the productions nominated “Tales of the Gridiron” featured the Winner Warrior football team. 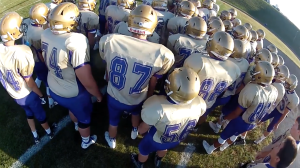 South Dakota Public Television talked to coaches, players and parents about the football tradition in Winner. The public television crew spent time in Winner filming a football game. 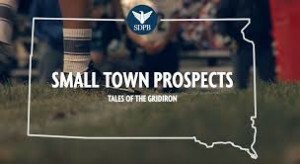 The stories behind rural South Dakota communities supporting their local football teams was the theme of the production by SDPB. The producer was Brad Van Osdel with Andrew Bork the producer/videographer. Winners will be announced at the National Academy of Television Arts & Sciences upper Midwest Emmy gala Oct. 7 in Bloomington, Minn. 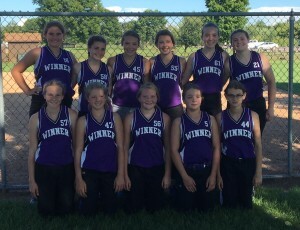 The Winner Middle School softball team split two games on Sunday. Winner defeated Sioux Falls Nation in the first game 4-1. Leading hitters for Winner were Josey Kludt with a double and two RBIs, Hattie Hespe with a double and RBI and Libbie Peterse with single and RBI. Rylee Root pitched the win. Winner was then defeated by Dells Dynasty 6-5. Leading hitters were Aleya Miller and Melanie Brozik each with a single and RBI. Libbie Petersek, Rylee Root and Kelbi Meiners each contributed a hit as well. Faith Covey and Root each pitched in this game. Winner ended league play with a 5-3 record. State tournament elimination play begins Oct. 1 at Dunham Park in Sioux Falls. The Animal Clinic and the Insurance Center sponsor the fall softball team. The Winner Community Playhouse will present the comedy “The Savannah Sipping Society” Oct. 6-7 and Oct. 12-13-14. The play will be presented each night at 7:30 p.m. and the doors will open at 7 p.m. The reservation line is now open for persons to call and reserve seats for this production. To make a reservation call 842-1958. 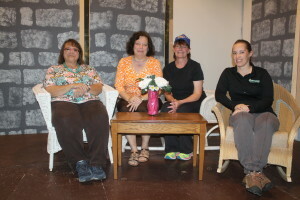 The four main cast members are Barb DeSersa, Sandra York, Tami Comp and Brandy Biggins. There will be four to five persons who will have cameo roles in the play. The play is directed by Sandra York with Dan Patmore as the technical director. In this delightful laugh-a-minute comedy four unique Southern women, all needing to escape the sameness of their day to day routines, are drawn together by fate—and an impromptu happy hour—and decide it is high time to reclaim the enthusiasm for life they’ve lost through the years. Over the course of six months these middle aged women successfully bond and find the confidence to jumpstart their new lives. 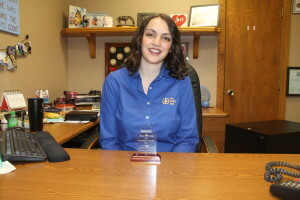 Amy Penning, loan officer at First Fidelity Bank of Winner, received the top loan officer of the year award for Region 6. The award was presented by the South Dakota Housing Development Authority at the annual housing conference in Pierre on Sept. 12. The award is based on the number of home loans. Penning has worked at First Fidelity Bank for two years. Winner Warrior broke an 8-8 halftime score to go on and defeat Mount Vernon/Plankinton 20-14 Friday afternoon in Mt. Vernon. This game was moved up to 4 p.m. due to the threat of inclement weather later in the evening. The Warriors, ranked No. 4 in Class 11B, are 4-1 as they won the SESD Conference game. “We struggled a times. 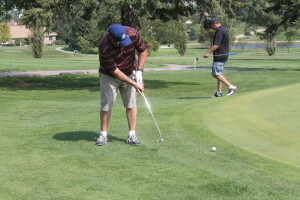 I did not think our preparation was very good this week,” said coach Dan Aaker. Winner made a nice drive in the first quarter with Carter Brickman throwing a 24 yard pass to Riley Calhoon for the touchdown. Ty Bolton makes the 2 point conversion and Winner is up 8-0. Two minutes after the Winner score, MVP comes back and ties the game at 8-8. “They outplayed us on that drive and the next thing we know it is 8-8,” said Aaker. The Warriors retook the lead in the third quarter on a 4 yard run by Trevor Peters. This was followed in the 4th quarter by a 1 yard run by Brickman and the Warriors are up 20-8. With 1:31 left in the game, MVP scored on a 1 yard run and the score is 20-14. “We are really having to scramble at the end of the game,” said the coach. Aaker says he thinks everyone learned big lesson about being prepared for a football game. The Warriors had 292 rushing yards and a total of 308 yards in the game. 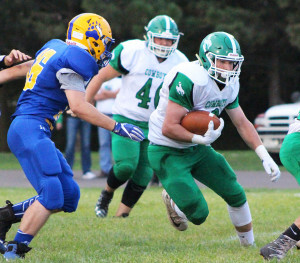 Phillip Jorgensen had 89 yards, Matt Smither, 76 yards, Riley Calhoon, 61 yards and Trevor Peters, 54 yards. Matt Smither had 13 tackles, Levi McClanahan, 12; Nick Lantz and Shea Connot, 6 each and Calhoon, 5. This is homecoming week in Winner and Friday night the Warriors will host Chamberlain in a 7 p.m. game. Aaker says Chamberlain has a nice team with a good quarterback. No. 2 ranked Colome scored 64 unanswered points Friday night as they rolled to a 64-14 victory over Alcester-Hudson. The game ended in the third quarter due to the mercy rule. The Cowboys were down early but quickly took control of the game. The Cowboys are undefeated with a 5-0 record. Kolton Salonen opened the scoring for Colome on a 17 yard pass from Layton Thieman. The Cowboys put up a lot of points in the second quarter. Scoring for Colome were Jackson Kinzer on a 9 yard run, Wyatt Cahoy on a 4 yard run, Kinzer intercepted a pass from a 36 yard touchdown, Cahoy on a 3 yard run and Chase Dufek on a 40 yard run. In the third quarter, Thieman scored on a 4 yard run and Linkyn Petersek on a 53 yard run. The Cowboys finished the game with 448 total yards. Kinzer had 170 yards, Dufek, 118 and Cahoy 19. 9 tackles and each had an interception, Beau Bertram and Salonen with 6 each. “We faced some adversity but we responded well as team,” said coach Ben Connot. “We had some people step up and play some important roles. I am pleased how we came back,” said Connot. This Friday Colome will host Scotland in a homecoming game at 7 p.m. Winner Lady Warriors volleyball team placed fourth at the Eastern Classic at Tri Valley on Saturday. Winner defeated Tri Valley in 3 sets 31-29, 24-26 and 25-8. Alexis Richey and Morgan Hammerbeck were 100 percent in serving. Richey had 3 ace serves and Hammerbeck, 2. Hammerbeck had 14 kills and Abby Marts, 13. Addy Root had 22 set assists. Richey and Hammerbeck were both 61 percent in serve receive. Richey had 20 digs and Hammerbeck and Abby Marts both had 18 kills. JaiWanda Roubideaux had 2 solo blocks and Sam Marts had 1 solo block and 2 bloc assists. As a team, Winner was 98 percent in serving with 6 aces, 34 kills, 25 assists. The team was 52 percent in serve receive with 76 digs and 4 blocks. Winner got beat by Tea in 3 sets. Abby Marts was 100 percent in serving. Richey and Hammerbeck had 3 ace serves. Abby Marts had 11 kills and Hammerbeck, 8. Addy Root had 23 set assists. Richey was 80 percent in serve receive and had 16 digs. Hammerbeck had 12 digs. Sam Marts had 4 solo blocks and 3 block assists. Roubideaux had 2 block assists and Hammerbeck, 2 block assists. 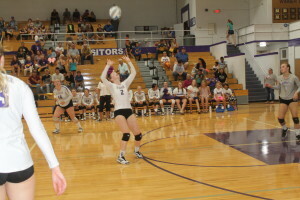 The Lady Warriors were 87 percent in serving with 12 aces, 24 kills, 54 percent in serve receive, 54 digs and 9 blocks. Winner got beat by Elk Point Jefferson in the third and fourth place match. Winner lost in 3 sets 25-15, 18-25, 15-25. Hammerbeck and Abby Marts were 100 percent in serving. Hammerbeck along with both Sam and Abby Marts each had 1 ace serve. Abby Marts had 11 kills and Hammerbeck, 8. Root had 15 set assists. Abby Marts was 90 percent in serve receive and Richey was 75 percent. Hammerbeck and Richey each had 17 digs. Abby Marts had 3 solo blocks and Sam Marts, 1. As a team, Winner was 97 percent in serving with 3 ace serves, 23 kills, 19 set assists, 63 percent in serve receive with 63 digs and 4 blocks. “We played very inconsistent and had a lot of ups and downs during the day,” said coach Jaime Keiser. “We would play very good one minute and then everything would fall apart the next time. We had a lot of serve receive, serving and attack errors which gave our opponents too many unearned points,” said Keiser. The next action for Winner will be Oct. 3 at home against Gregory. Winner High School boys golf team took part in the pre-regional on Sept. 19 in Pierre. Gage Watson led the Winner golfers as he placed 20th. Nathan Monk placed 31st and Jayd Whitley placed 34th. Parkston won the team title.